The Oklahoma Democratic Party and Oklahoma Senate Democrats quickly released statements after the announcement of the state Supreme Court’s ruling that the “cigarette fee” passed during the last week of the session in May is unconstitutional. “The opinion issued today by the Oklahoma Supreme Court finding that the so-called “cigarette fee” passed by the legislature was, in fact, an unconstitutional tax comes as no surprise. We knew this tax was unconstitutional when it was passed by the legislature back in May. We made the same arguments that the Court has articulated in today’s opinion when Republican leadership at the Capitol was playing partisan political games and pushing this desperate revenue measure through during the last hours of the 2017 regular session. “This kind of unconstitutional legislation is nothing new from the Republican leadership at the Capitol. Unfortunately, we are used to wasting money paying lawyers to defend their unconstitutional bills. What makes this situation new, and worse, is that now we are going to have to spend hundreds of thousands of taxpayer dollars in a special session doing the job that should have been done back in May. “We need to approach a special session thoughtfully with real plans for revenue measures that can fill the $215 million budget hole which has been created at the Oklahoma Department of Mental Health and Substance Abuse Services, the Oklahoma Healthcare Authority and the Department of Human Services. We need to set clear priorities, take hard votes and make tough choices with all revenue options on the table for open, transparent discussion and debate. This is a time for cooperation and compromise. This is the time for a plan of action, accountability and real results. This is what our constituents demand of us and what they deserve from us with no exceptions and no excuses. In light of the Oklahoma Supreme Court’s cigarette “tax” fee ruling, the Oklahoma Democratic Party insists that Governor Fallin call for a special session to address the budget hole crisis that was never resolved earlier this year. Republicans have failed Oklahomans. The Republican-Super-Majority had a chance to work together with Democrats on developing sustainable recurring revenue during session, but they instead chose to knowingly push through unconstitutional bills, wasting tax payer’s time and money. Oklahomans shouldn’t have to pay for Republican failures. It’s time for Republicans to step up and prove they care about Oklahomans and do their job. It’s time for Republicans to work with Democrats on a long-term sustaining recurring revenue plan. Even Oklahoma’s corporate power structure believes the state needs more college graduates, but do not count on U.S. Sen. Jim Inhofe to help out. Inhofe was one of just twelve U.S. Senators who recently voted against a bill to expand federal aid for college students. President George Bush has said he will sign the bill, which passed the Senate 79-12 and the House 292-97. The extra funding will be financed by cutting fees to banks on loans provided to students. Oklahoma lags behind the nation in the number of college graduates. The state’s corporate media outlets often bemoan the fact the state’s two major metropolitan areas, Oklahoma City and Tulsa, do not have enough educated, highly-skilled workers to attract or sustain businesses. This bill provides better access to loans for students and will increase the state’s business viability. So why did Inhofe vote against the bill, even though many Republicans supported the measure? 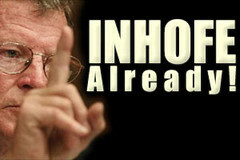 Inhofe is a shill for big corporations, including major banks and oil companies. He has completely lost touch with ordinary Oklahomans, who have faced skyrocketing college tuition in recent years. He has “gone Washington.” He rewards big corporations as he denigrates ordinary Oklahomans trying to go to college. Inhofe is a highly partisan extremist who fails to take into account Oklahoma’s particular needs and issues.